Since the partition of British India in 1947 and creation of modern states of India and Pakistan, the two countries have been involved in a number of wars, conflicts and military stand-offs. The Kashmir issue has been the main cause of all major conflicts between the two countries with the exception of the Indo-Pakistani War of 1971 where conflict originated due to turmoil in erstwhile East Pakistan (now Bangladesh). Princely-ruled territories, such as Kashmir and Hyderabad, were also involved in the Partition. Rulers of these territories had the choice of joining India or Pakistan. The war, also called the First Kashmir War, started in October 1947 when Pakistan feared that the Maharaja of the princely state of Kashmir and Jammu would accede to India. Following partition, princely states were left to choose whether to join India or Pakistan or to remain independent. Jammu and Kashmir, the largest of the princely states, had a majority Muslim population and significant fraction of Hindu population, all ruled by the Hindu Maharaja Hari Singh. Tribal Islamic forces with support from the army of Pakistan attacked and occupied parts of the princely state forcing the Maharaja to sign the Instrument of Accession of the princely state to the Dominion of India to receive Indian military aid. The UN Security Council passed Resolution 47 on 22 April 1948. The fronts solidified gradually along what came to be known as the Line of Control. A formal cease-fire was declared at 23:59 on the night of 1 January 1949.:379 India gained control of about two-thirds of the state (Kashmir valley, Jammu and Ladakh) whereas Pakistan gained roughly a third of Kashmir (Azad Kashmir, and Gilgit–Baltistan). The Pakistan controlled areas are collectively referred to as Pakistan administered Kashmir. This war started following Pakistan's Operation Gibraltar, which was designed to infiltrate forces into Jammu and Kashmir to precipitate an insurgency against rule by India. India retaliated by launching a full-scale military attack on West Pakistan. The seventeen-day war caused thousands of casualties on both sides and witnessed the largest engagement of armored vehicles and the largest tank battle since World War II. The hostilities between the two countries ended after a ceasefire was declared following diplomatic intervention by the Soviet Union and USA and the subsequent issuance of the Tashkent Declaration. India had the upper hand over Pakistan when the ceasefire was declared. 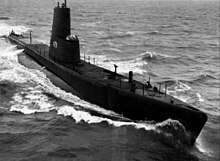 Pakistan's PNS Ghazi, the Pakistani submarine which sank during the 1971 Indo-Pakistani War under mysterious circumstances off the Visakhapatnam coast. This war was unique in the way that it did not involve the issue of Kashmir, but was rather precipitated by the crisis created by the political battle brewing in erstwhile East Pakistan (now Bangladesh) between Sheikh Mujibur Rahman, Leader of East Pakistan, and Yahya Khan and Zulfikar Ali Bhutto, leaders of West Pakistan. This would culminate in the declaration of Independence of Bangladesh from the state system of Pakistan. Following Operation Searchlight and the 1971 Bangladesh atrocities, about 10 million Bengalis in East Pakistan took refuge in neighbouring India. India intervened in the ongoing Bangladesh liberation movement. After a large scale pre-emptive strike by Pakistan, full-scale hostilities between the two countries commenced. Commonly known as the Kargil War, this conflict between the two countries was mostly limited. During early 1999, Pakistani troops infiltrated across the Line of Control (LoC) and occupied Indian territory mostly in the Kargil district. India responded by launching a major military and diplomatic offensive to drive out the Pakistani infiltrators. Two months into the conflict, Indian troops had slowly retaken most of the ridges that were encroached by the infiltrators. According to official count, an estimated 75%–80% of the intruded area and nearly all high ground was back under Indian control. Fearing large-scale escalation in military conflict, the international community, led by the United States, increased diplomatic pressure on Pakistan to withdraw forces from remaining Indian territory. Faced with the possibility of international isolation, the already fragile Pakistani economy was weakened further. The morale of Pakistani forces after the withdrawal declined as many units of the Northern Light Infantry suffered heavy casualties. The government refused to accept the dead bodies of many officers, an issue that provoked outrage and protests in the Northern Areas. Pakistan initially did not acknowledge many of its casualties, but Nawaz Sharif later said that over 4,000 Pakistani troops were killed in the operation and that Pakistan had lost the conflict. By the end of July 1999, organized hostilities in the Kargil district had ceased. The war was a major military defeat for the Pakistani Army. Apart from the aforementioned wars, there have been skirmishes between the two nations from time to time. Some have bordered on all-out war, while others were limited in scope. The countries were expected to fight each other in 1955 after warlike posturing on both sides, but full-scale war did not break out. Insurgency in Jammu and Kashmir: An insurgency in Kashmir has been a cause for heightened tensions. India has also accused Pakistan-backed militant groups of executing several terrorist attacks across India. Siachen conflict: In 1984, India launched Operation Meghdoot capturing all of the Siachen Glacier. Further clashes erupted in the glacial area in 1985, 1987 and 1995 as Pakistan sought, without success, to oust India from its stronghold. Sir Creek: The dispute lies in the interpretation of the maritime boundary line between Kutch and Sindh. Before India's independence, the provincial region was a part of Bombay Presidency of British India. After India's independence in 1947, Sindh became a part of Pakistan while Kutch became a part of India. Pakistan lays claim to the entire creek as per paras 9 and 10 of the Bombay Government Resolution of 1914 signed between the then Government of Sindh and Rao Maharaj of Kutch. India–Pakistan maritime trespassing: frequent trespassing and violation of respective national territorial waters of India and Pakistan in peacetime occurs commonly by Pakistani and Indian fishermen operating along the coastline of the Indian state of Gujarat and the Pakistani province of Sindh. Most violations occur due to the absence of a physical boundary and lack of navigational tools for small fishermen. Hundreds of fishermen are arrested by the Coast Guards of both nations, but obtaining their release is difficult and long-winded owing to the hostile relations between the two nations. Insurgency in Balochistan: An insurgency in Balochistan province of Pakistan has also caused tensions recently. Pakistan has accused India of causing the insurgency with the help of ousted Baloch leaders, militant groups and terrorist organizations like the Balochistan Liberation Army. According to Pakistani Officials these militants are trained in neighboring Afghanistan. In 2016, Pakistan alleged that an Indian spy Kulbhushan Jadhav was arrested by Pakistani forces during a counter-intelligence operation in Balochistan. Indian integration of Junagadh: The princely state of Junagadh, which had a Hindu majority and a Muslim ruler acceded to Pakistan on 15 September 1947, claiming a connection by sea. Pakistan's acceptance of the Instrument of Accession was seen as a strategy to get a plebiscite held in Kashmir which had a Muslim majority and a Hindu ruler. Following communal tensions Indian military entered the territory which was protested by Pakistan as a violation of International law. Later a plebiscite was held and the accession was reversed for the state to join India. 2001–2002 India–Pakistan standoff: The terrorist attack on the Indian Parliament on 13 December 2001, which India blamed on the Pakistan-based terrorist organisations, Lashkar-e-Taiba and Jaish-e-Mohammed, prompted the 2001–2002 India–Pakistan standoff and brought both sides close to war. 2008 India Pakistan standoff: a stand-off between the two nations following the 2008 Mumbai attacks which was defused by diplomatic efforts. Following ten coordinated shooting and bombing attacks across Mumbai, India's largest city, tensions heightened between the two countries since India claimed interrogation results alleging Pakistan's ISI supporting the attackers while Pakistan denied it. Pakistan placed its air force on alert and moved troops to the Indian border, voicing concerns about proactive movements of the Indian Army and the Indian government's possible plans to launch attacks on Pakistani soil. The tension defused in short time and Pakistan moved its troops away from border. India–Pakistan border skirmishes (2016–2018): On 29 September 2016, border skirmishes between India and Pakistan began following reported "surgical strikes" by India against militant launch pads across the Line of Control in Pakistani-administered Azad Kashmir. Pakistan rejected that a strike took place, stating that Indian troops had not crossed the Line of Control but had only skirmished with Pakistani troops at the border, resulting in the deaths of two Pakistani soldiers and the wounding of nine. Pakistan rejected India's reports of any other casualties. Pakistani sources reported that at least 8 Indian soldiers were killed in the exchange, and one was captured. India confirmed that one of its soldiers was in Pakistani custody, but denied that it was linked to the incident or that any of its soldiers had been killed. The Indian operation was said to be in retaliation for a militant attack on the Indian army at Uri on 18 September in the Indian-administered state of Jammu and Kashmir that left 19 soldiers dead. In the succeeding days and months, India and Pakistan continued to exchange fire along the border in Kashmir, resulting in dozens of military and civilian casualties on both sides. 2019 India–Pakistan standoff: On 14 February 2019, in the 2019 Pulwama attack, the Pakistan based, terrorist group Jaish-e-Mohammed claimed responsibility for a suicide bomb attack on a military convoy that killed over 40 Indian soldiers. India claimed on 26 February 2019, in retaliation, Indian Mirage 2000 jets conducted an air strike on a terrorist camp in Balakot in Khyber-Pakhtunwa province of Pakistan. India claimed that it killed very large number of militants belonging to JeM However, Pakistan claimed that its air force quickly scrambled to intercept the Indian air force attack, causing the attacking planes to drop their payload hurriedly in a wooded area near Balakot, causing four explosions and damage to conifers. According the neutral source and satellite imagery analysis, Indian air force appears to caused no visible damage to the exterior of the buildings concerned. The incidents escalated the tension between India and Pakistan. The following day, Pakistani officals announced that Pakistan Air Force (PAF) had carried out airstrikes against targets inside Indian administered Kashmir. It also claimed to have shot down at least one Indian aircraft and capturing one pilot. Pakistan military officals claimed that the wreckage of one Indian aircraft fell in Pakistan administered Kashmir while the other one fell in Indian administered Kashmir. Indian officals confirmed that Pakistan airforce had conducted airstrikes in Indian administered Kashmir. Indian officials initially rejected any Indian aircraft being shot down but later confirmed that one of their planes had crashed after Pakistani officals had uploaded the video of captured pilot. The captured pilot was identified to be Abhinandan Varthaman. India claimed Abhinandan had shot down a Pakistani F-16 that violated its airspace, during the dogfight. The IAF also displayed remnants of an AIM-120 AMRAAM missile that they claimed could only be fired by F-16's air planes. Atlantique Incident: Pakistan Navy's Naval Air Arm Breguet Atlantique patrol plane, carrying 16 people on board, was shot down by the Indian Air Force for alleged violation of airspace. The episode took place in the Rann of Kutch on 10 August 1999, just a month after the Kargil War, creating a tense atmosphere between India and Pakistan. Foreign diplomats noted that the plane fell inside Pakistani territory, although it may have crossed the border. However, they also believe that India's reaction was unjustified. Pakistan later lodged a compensation claim at the International Court of Justice, accusing India for the incident, but the Court dismissed the case in a split decision ruling the Court did not have jurisdiction. The 2011 India–Pakistan border shooting incident took place between 30 August and 1 September 2011 across the Line of Control in Kupwara District/Neelam Valley, resulting in five Indian soldiers and three Pakistani soldiers being killed. Both countries gave different accounts of the incident, each accusing the other of initiating the hostilities. 2013 India–Pakistan border incident in the Mendhar sector of Jammu & Kashmir, due to the beheading of an Indian soldier. A total of 22 soldiers (12 Indian and 10 Pakistani) died. 2014–16 India–Pakistan border skirmishes in Arnia sector of Jammu & Kashmir due to killing of 1 soldier of Border Security Force and injured 3 soldiers and 4 civilians by Pakistan Rangers. 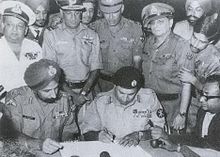 The nuclear conflict between both countries is of passive strategic nature with nuclear doctrine of Pakistan stating a first strike policy, although the strike would only be initiated if and only if, the Pakistan Armed Forces are unable to halt an invasion (as for example in 1971 war) or a nuclear strike is launched against Pakistan, whereas India has a declared policy of no first use. Pokhran-I (Smiling Buddha): On 18 May 1974 India detonated an 8-kiloton nuclear device at Pokhran Test Range, becoming the first nation to become nuclear capable outside the five permanent members of United Nations Security Council as well as dragging Pakistan along with it into a nuclear arms race with the Pakistani prime minister Zulfikar Ali Bhutto swearing to reciprocate India quoting "My countrymen would prefer having a nuclear bomb even if they have to eat grass". The Pakistan Atomic Energy Commission (PAEC) Chairman Munir Ahmed Khan said that the test would force Pakistan to test its own nuclear bomb. Kirana-I: In the 1980s a series of 24 different cold tests were conducted by PAEC, led by chairman Munir Ahmad Khan under extreme secrecy. The tunnels at Kirana Hills, Sargodha, are reported to have been bored after the Chagai nuclear test sites, it is widely believed that the tunnels were constructed sometime between 1979 and 1983. As in Chagai, the tunnels at Kirana Hills had been bored and then sealed and this task was also undertaken by PAEC's DTD. Later due to excessive US intelligence and satellite focus on the Kirana Hills site, it was abandoned and nuclear weapons testing was shifted to the Kala Chitta Range. Pokhran-II (Operation Shakti): On 11 May 1998 India detonated another five nuclear devices at Pokhran Test Range. With jubilation and large scale approval from the Indian society came International sanctions as a reaction to this test, the most vehement reaction of all coming from Pakistan. Great ire was raised in Pakistan, which issued a stern statement claiming that India was instigating a nuclear arms race in the region. Pakistan vowed to match India's nuclear capability with statements like: "We are in a headlong arms race on the subcontinent". Chagai-I: (Youm-e-Takbir) Within half a month of Pokhran-II, on 28 May 1998 Pakistan detonated five nuclear devices to reciprocate India in the nuclear arms race. Pakistani public, like the Indian, reacted with a celebration and heightened sense of nationalism for responding to India in kind and becoming the only Muslim nuclear power. The day was later given the title Youm-e-Takbir to further proclaim such. Chagai-II: Two days later, on 30 May 1998, Pakistan detonated a sixth nuclear device completing its own series of underground tests with this being the last the two nations have carried out to date. 28 May (since 1998) as Youm-e-Takbir (The day of Greatness) in Pakistan. 26 July (since 1999) as Kargil Vijay Diwas (Kargil Victory Day) in India. 6 September (since 1965) as Defence Day (Youm-e-Difa) in Pakistan. 7 September (since 1965) as Air Force Day (Youm-e-Fizaya) in Pakistan. 8 September (since 1965) as Victory Day/Navy Day (Youm-e-Bahr'ya) in Pakistan. 4 December (since 1971) as Navy Day in India. 16 December (since 1971) as Vijay Diwas (Victory Day) in India. 16 December (since 1971) as Bijoy Dibosh (Victory Day) in Bangladesh. The USSR remained neutral during the 1965 war and played a pivotal role in negotiating the peace agreement between India and Pakistan. The Soviet Union provided diplomatic and military assistance to India during the 1971 war. In response to the US and UK's deployment of the aircraft carriers USS Enterprise and HMS Eagle, Moscow sent nuclear submarines and warships with anti-ship missiles in the Arabian Sea and Indian Ocean, respectively. The US had not given any military aid to Pakistan in the Indo-Pakistani War of 1965. The United States provided diplomatic and military support to Pakistan during the 1971 war by sending USS Enterprise into the Indian Ocean. The United States did not support Pakistan during the Kargil War, and successfully pressured the Pakistani administration to end hostilities. China had helped Pakistan in various wars with diplomatic support. Russia maintained a non-belligerent policy for both sides. Russia helped negotiate peace in 2001–02 and helped divert the 2008 crisis. These wars have provided source material for both Indian and Pakistani film and television dramatists, who have adapted events of the war for the purposes of drama and to please target audiences in their nations. Hindustan Ki Kasam, a 1973 Hindi war film based on Operation Cactus Lilly of the 1971 Indo-Pakistani War, directed by Chetan Anand. Aakraman, a 1975 Hindi war film based on the 1971 Indo-Pakistan war, directed by J. Om Prakash. Vijeta, a 1982 Hindi film based on the 1971 Indo-Pakistan war, produced by Shashi Kapoor and directed by Govind Nihalani. Param Vir Chakra, a 1995 Hindi film based on Indo-Pakistani War, directed by Ashok Kaul. Border, a 1997 Hindi war film based on the Battle of Longewala of the 1971 Indo-Pakistan war, directed by J.P.Dutta. LOC Kargil, a 2003 Hindi war film based on the Kargil War, directed by J. P. Dutta. Deewaar, a 2004 Hindi film starring Amitabh Bachchan based on the POW of the 1971 Indo-Pakistan war, directed by Milan Luthria. Lakshya, a 2004 Hindi film partially based on the events of the Kargil War, directed by Farhan Akhtar. 1971, 2007 Hindi war film based on a true story of prisoners of war after the Indo-Pakistani war of 1971, directed by Amrit Sagar. Kurukshetra, a 2008 Malayalam film starring Mohanlal based on Kargil War, directed by Major Ravi. Tango Charlie, a 2005 Hindi film starring Ajay Devgan, and Bobby Deol based on Kargil Conflict, directed by Mani Shankar. The Ghazi Attack, a 2017 Telugu and Hindi bilingual film based on the sinking of PNS Ghazi. 1971: Beyond Borders, a 2017 Malayalam film, directed by Major Ravi. Uri: The Surgical Strike, a 2019 Hindi film about India's surgical strike into the Pakistani base camps after the URI incident in 2016. ^ a b Khan, Yasmin (2007). The great Partition: the making of India and Pakistan. Yale University Press. p. 13. ISBN 978-0-300-12078-3. Retrieved 30 October 2011. ^ Dixit, Jyotindra Nath (2002). India-Pakistan in War & Peace. Routledge. p. 13. ISBN 978-0-415-30472-6. ^ Prasad, S.N. ; Dharm Pal (1987). 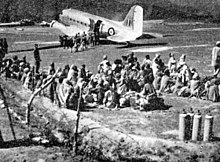 History of Operations in Jammu and Kashmir 1947–1948. New Delhi: History Department, Ministry of Defence, Government of India. (printed at Thomson Press (India) Limited). p. 418. ^ Hagerty, Devin (2005). South Asia in World Politics. Rowman & Littlefield. p. 161. ISBN 9780742525870. Retrieved 2016-03-06. ^ The Kingfisher History Encyclopedia. Kingfisher. 2004. p. 460. ISBN 9780753457849. Retrieved 2016-03-06. ^ New Zealand Defence Quarterly, Issues 24-29. New Zealand. Ministry of Defence. 1999. Retrieved 2016-03-06. ^ Thomas, Raju (1992). Perspectives on Kashmir: the roots of conflict in South Asia. Westview Press. p. 25. ISBN 9780813383439. Retrieved 2016-03-06. ^ David R. Higgins 2016. ^ a b c d Lyon, Peter (2008). Conflict between India and Pakistan: an encyclopedia. ABC-CLIO. p. 82. ISBN 978-1-57607-712-2. Retrieved 30 October 2011. ^ Dijink, Gertjan (2002). National Identity and Geopolitical Visions: Maps of Pride and Pain. Routledge. ISBN 9781134771295. 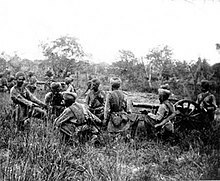 The superior Indian forces, however, won a decisive victory and the army could have even marched on into Pakistani territory had external pressure not forced both combatants to cease their war efforts. ^ a b "Pakistan :: The Indo-Pakistani War of 1965". Library of Congress Country Studies, United States of America. April 1994. Retrieved 2 October 2010. Quote: Losses were relatively heavy--on the Pakistani side, twenty aircraft, 200 tanks, and 3,800 troops. Pakistan's army had been able to withstand Indian pressure, but a continuation of the fighting would only have led to further losses and ultimate defeat for Pakistan. ^ Hagerty, Devin. South Asia in world politics. Rowman & Littlefield, 2005. p. 26. ISBN 0-7425-2587-2. Quote: The invading Indian forces outfought their Pakistani counterparts and halted their attack on the outskirts of Lahore, Pakistan's second-largest city. By the time United Nations intervened on 22 September, Pakistan had suffered a clear defeat. ^ Wolpert, Stanley (2005). India (3rd ed. with a new preface. ed.). Berkeley: University of California Press. p. 235. ISBN 0520246969. Quote: India, however, was in a position to inflict grave damage to, if not capture, Pakistan's capital of the Punjab when the cease-fire was called, and controlled Kashmir's strategic Uri-Poonch bulge, much to Ayub's chagrin. ^ Kux, Dennis (1992). India and the United States : Estranged democracies, 1941-1991. Washington, DC: National Defense University Press. p. 238. ISBN 0788102796. Quote: India had the better of the war. ^ Till, Geoffrey (2004). Seapower: a guide for the twenty-first century. Great Britain: Frank Cass Publishers. p. 179. ISBN 0-7146-8436-8. Retrieved 2010-05-28. ^ Christophe Jaffrelot, Gillian Beaumont. A History of Pakistan and Its Origins. Anthem Press, 2004. ISBN 1-84331-149-6. ISBN 9781843311492. ^ Times Staff and Wire Reports (30 March 2002). "Gen. Tikka Khan, 87; 'Butcher of Bengal' Led Pakistani Army". Los Angeles Times. Retrieved 30 October 2011. ^ Syed Badrul Ahsan (15 July 2011). "A Lamp Glows for Indira Gandhi". Volume 10, Issue 27. The Daily Star. Retrieved 30 October 2011. ^ Nawaz, Shuja (2008). Crossed Swords: Pakistan, Its Army, and the Wars Within. Oxford University Press. p. 329. ISBN 978-0-19-547697-2. ^ Chitkara, M. G (1996). Benazir, a Profile – M. G. Chitkara. ISBN 9788170247524. Retrieved 27 July 2012. ^ Schofield, Victoria (18 January 2003). Kashmir in Conflict: India, Pakistan and the Unending War – Victoria Schofield. ISBN 9781860648984. Retrieved 27 July 2012. ^ Leonard, Thomas (2006). Encyclopedia of the developing world. Taylor & Francis. ISBN 978-0-415-97662-6. ^ Unspecified author. "The 1971 war". India – Pakistan:Troubled relations. BBC. Retrieved 30 October 2011. ^ Ali, Tariq (1997). Can Pakistan Survive? The Death of a State. Verso Books. ISBN 0-86091-949-8. ISBN 9780860919490. ^ a b c Wolpert, Stanley (14 Aug 2010). "Recent Attempts to Resolve the Conflict". India and Pakistan: Continued Conflict or Cooperation?. University of California Press. p. 73. ISBN 9780520271401. ^ Ali, Tariq. "Bitter Chill of Winter". London Review of Books=. Retrieved 2009-05-20. ^ a b R. Dettman, Paul (2001). 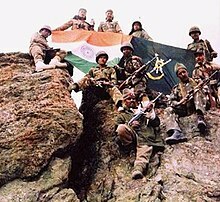 "Kargil War Operations". India Changes Course: Golden Jubilee to Millennium. Greenwood Publishing Group. pp. 119–120. ISBN 9780275973087. ^ Daryl Lindsey and Alicia Montgomery. "Coup d'itat: Pakistan gets a new sheriff". salon.com. Archived from the original on 20 December 2009. Retrieved 19 June 2015. ^ "War in Kargil - The CCC's summary on the war" (PDF). Archived from the original (PDF) on 21 February 2004. Retrieved 20 May 2009. ^ "Rediff On The NeT: Pakistan refuses to take even officers' bodies". rediff.com. Retrieved 19 June 2015. ^ "Over 4000 soldier's killed in Kargil: Sharif". The Hindu. Retrieved 2009-05-20. ^ Kapur, S. Paul (2007). Dangerous Deterrent: Nuclear Weapons Proliferation and Conflict in South Asia (23rd ed.). Stanford University Press. p. 227. ISBN 978-0804755498. ^ MacDonald, Myra (2017). Defeat is an Orphan: How Pakistan Lost the Great South Asian War. Oxford University Press. pp. 27, 53, 64, 66. ISBN 978-1-84904-858-3. p. 27: It was not so much that India won the Great South Asian War but that Pakistan lost it. Less than a year after declaring itself a nuclear-armed power, Pakistan had been humiliated diplomatically and militarily. ^ Lavoy, Peter René, ed. (2009). Asymmetric Warfare in South Asia: The Causes and Consequences of the Kargil Conflict. Cambridge University Press. p. 180. ISBN 978-0-521-76721-7. The false optimism of the architects of the Kargil intrusion, colored by the illusion of a cheap victory, was not only the main driver of the operation, and hence the crisis, it also was the cause of Pakistan's most damaging military defeat since the loss of East Pakistan in December 1971. ^ Wirsing, Robert (15 February 1998). India, Pakistan, and the Kashmir dispute: on regional conflict and its resolution. Palgrave Macmillan. p. 77. ISBN 978-0-312-17562-7. Retrieved 31 October 2011. ^ "India-Pakistan talks: Sir Creek". Embassy of India. Retrieved 21 May 2006. ^ "Dialogue on Sir Creek begins". The Hindu. Retrieved 21 May 2006. ^ a b "India to stop fishermen from straying into Pakistan". In.reuters.com. 7 April 2008. Retrieved 27 July 2012. ^ Raman, Sunil (8 April 2008). "India tracks stray fishing boats". BBC News. Retrieved 27 July 2012. ^ "Plight of ants". Rediff.com. 7 August 2002. Retrieved 27 July 2012. ^ "India's renewed strategy of destabilising Balochistan". Daily Times. 2018-08-20. Retrieved 2019-01-31. ^ "Indian campaigning on Balochistan continues". www.thenews.com.pk. Retrieved 2019-01-31. ^ History introduction Archived 26 March 2012 at the Wayback Machine at hellojunagadh.com: "On September 15, 1947, Nawab Mohammad Mahabat Khanji III of Junagadh, a princely state located on the south-western end of Gujarat and having no common border with Pakistan, chose to accede to Pakistan ignoring Mountbatten's views, arguing that Junagadh adjoined Pakistan by sea. The rulers of two states that were subject to the suzerainty of Junagadh Mangrol and Babariawad reacted by declaring their independence from Junagadh and acceding to India." ^ Gandhi, Rajmohan (1991). Patel: A Life. India: Navajivan. p. 292. ASIN B0006EYQ0A. ^ Gandhi, Rajmohan (1991). Patel: A Life. India: Navajivan. p. 438. ASIN B0006EYQ0A. ^ A.G. NOORANI. "Of Jinnah and Junagadh". Retrieved 27 May 2011. ^ Weisman, Steven R. (6 March 1987). "On India's border, a huge mock war". The New York Times. Retrieved 30 October 2011. ^ Unspecified author (12 January 2002). "Musharraf declares war on extremism". South Asia. BBC. Retrieved 30 October 2011. ^ Freeze, Colin (11 April 2011). "Accused in India massacre claims ties to Pakistani secret service – The Globe and Mail". The Globe and Mail. Toronto. ^ "Rana, Headley implicate Pak, ISI in Mumbai attack during ISI chief's visit to US". The Times of India. 12 April 2011. ^ Khan, Zarar (1 December 2008). "Pakistan Denies Government Involvement in Mumbai Attacks". Huffington Post. Retrieved 16 December 2011. ^ "Indian jets violating Pakistani airspace 'technical incursion', says Zardari (Fourth Lead) – Thaindian News". Thaindian.com. 14 December 2008. Retrieved 16 December 2011. ^ "Pak might soon move troops from border with India". The Times of India. 16 June 2009. ^ CNN, Juliet Perry. "Pakistan captures Indian soldier in Kashmir". cnn.com. Archived from the original on 1 October 2016. ^ Miglani, Sanjeev; Hashim, Asad (29 September 2016). "India says hits Pakistan-based militants, escalating tensions". Reuters. Archived from the original on 5 October 2016. Retrieved 5 October 2016. ^ Abbas, Syed Sammer (29 September 2016). "Army rubbishes Indian 'surgical strikes' claim as two Pakistani soldiers killed at LoC". Dawn. Archived from the original on 30 September 2016. Retrieved 30 September 2016. ^ Masood, Salman (1 October 2016). "In Kashmir, Pakistan Questions India's 'Surgical Strikes' on Militants". New York Times. Archived from the original on 5 October 2016. Retrieved 1 October 2016. ^ Haider, Abrar (29 September 2016). "Pakistan captures one Indian soldier, eight killed at LoC overnight". Dawn. Archived from the original on 30 September 2016. Retrieved 29 September 2016. ^ "Indian Army Says Soldier In Pak Custody Was Not Captured During Surgical Strikes". NDTV.com. 30 September 2016. Archived from the original on 30 September 2016. Retrieved 30 September 2016. ^ "India evacuates 10,000 from border with Pakistan amid reprisal fears after Kashmir 'strikes'". Daily Telegraph. 30 September 2016. Archived from the original on 1 October 2016. Retrieved 30 September 2016. ^ "India Hits Main Jaish Camp In Balakot, "Non-Military" Strike: Government". NDTV.com. Retrieved 26 February 2019. ^ "Pakistan army confirms Indian jets dropped 'four bombs'". The Times of India. Press Trust of India. ^ "Viewpoint: India strikes in Pakistan a major escalation". 2019-02-26. Retrieved 2019-02-26. ^ Iain Marlow and Kamran Haider. "Pakistan Downs Two Indian Jets, Pilot Arrested, Army Says". Bloomberg. Retrieved 2019-02-27. ^ "The Case concerning the Aerial Incident of 10th August, 1999 – Summaries of Judgments and Orders". International Court of Justice. 21 June 2000. Retrieved 18 December 2011. ^ "In 2011 five security men were martyred, according to the Indian Sources". IBN Live. ^ "Kashmir border deaths spark India and Pakistan row". BBC. 1 September 2011. Retrieved 2 September 2011. ^ "LoC: Three Pakistani soldiers died in attack by Indian forces". The Express Tribune. 1 September 2011. Retrieved 1 September 2011. ^ "Pak troops kill two jawans, behead, mutilate one of them - The Times of India". The Times Of India. ^ "India and Pakistan exchange fire along border in Kashmir". ^ "India's Nuclear Weapons Program – Smiling Buddha: 1974". Nuclear Weapon Archive. ^ "India's Nuclear Weapons Program – Smiling Buddha: 1974". Nuclearweaponarchive.org. Retrieved 16 December 2011. ^ APP and Pakistan Television (PTV), Prime minister Secretariat Press Release (18 May 1974). "India's so-called Peaceful Nuclear Explosion (PNE) is tested and designed to intimidate and establish "Indian hegemony in the subcontinent", most particularly Pakistan....Zulfikar Ali Bhutto, past Prime minister of Pakistan, on May of 1974.". Statement published on Associated Press of Pakistan and the on-aired on Pakistan Television (PTV). Archived from the original on 18 September 2011. ^ a b "Koh Kambaran (Ras Koh Hills)". Pakistan Paedia. ^ "Rediff on the NeT: It was 'Operation Shakti' on Budh Purnima". Rediff.com. 16 May 1998. Retrieved 16 December 2011. ^ Herald Exclusive By Pervez Hoodbhoy 16 February 2011 (16 February 2011). "Herald exclusive: Pakistan's nuclear bayonet | Pakistan". Dawn.Com. Retrieved 16 December 2011. ^ "Army Chief Kayani wants SC to probe memo". Thenews.com.pk. 22 February 1923. Archived from the original on 30 May 2008. Retrieved 16 December 2011. ^ a b "Pakistan's Nuclear Weapons Program – 1998: The Year of Testing". Nuclearweaponarchive.org. Retrieved 16 December 2011. ^ "Pakistan Nuclear Weapons". Fas.org. Retrieved 16 December 2011. ^ "Dunya News: Pakistan:-13th Youm-e-Takbeer to be observed today". Dunyanews.tv. 28 May 2011. Retrieved 16 December 2011. ^ "Youm-e-Takbeer today | Pakistan | News | Newspaper | Daily | English | Online". Nation.com.pk. 28 May 2009. Retrieved 16 December 2011. ^ a b Battle for Pakistan: the air war of 1965 – John Fricker – Google Boeken. Google Books. 1 January 1979. ISBN 978-0-7110-0929-5. Retrieved 16 December 2011. ^ "1971 India Pakistan War: Role of Russia, China, America and Britain". The World Reporter. Retrieved 30 October 2011. ^ "Cold war games". Bharat Rakshak. Archived from the original on 9 June 2011. Retrieved 20 October 2009. ^ Birth of a nation. Indianexpress.com (11 December 2009). Retrieved on 2011-04-14. ^ "United States – Pakistan Alliance". Library of Congress Country Studies, United States of America. April 1994. Retrieved 29 October 2010. ^ 1971 War: How the US tried to corner India. Rediff.com. Retrieved on 2011-04-14. ^ Burne, Lester H. (2003). Chronological History of U.S. Foreign Relations: 1932–1988. Routledge. ISBN 0-415-93916-X. ISBN 9780415939164. ^ "BBC News - South Asia - Kashmir: Dialogue call amid fresh fighting". news.bbc.co.uk. ^ "India and Pakistan: Over the Edge". Time Magazine. 13 December 1971. Retrieved 17 August 2011. ^ Naqvi, Javed (29 December 2001). "Pressure mounts to stall war rhetoric". Dawn archives. Retrieved 24 December 2012. ^ Agencies (4 October 2012). "Pakistan, Russia renewing ties". Dawn Newspapers. Retrieved 24 December 2012. ^ "Param Vir Chakra (1995)". IMDB. Retrieved 26 November 2011. ^ a b APP 25 November 2011 (25 November 2011). "Prominent writer, actor, Rauf Khalid dies in road accident | Entertainment". Dawn.Com. Retrieved 15 January 2012. Wikimedia Commons has media related to Indo-Pakistani wars.